Last month my girls made these cupcakes for the first time. With the feast of St. Anne coming up on July 26th, I thought I would share the recipe here at Catholic Cuisine, continuing the Watermelon Theme for St. Anne's feast day which was originally inspired by Charlotte and her girls! Make your own Cupcakes from scratch or using a boxed mix. 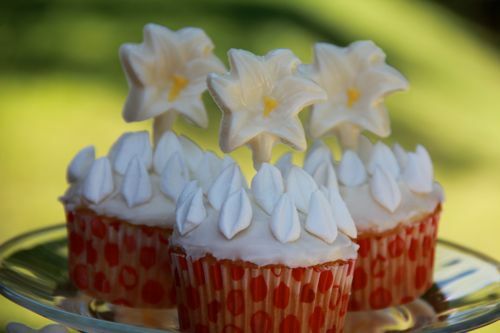 Use cupcake liners. 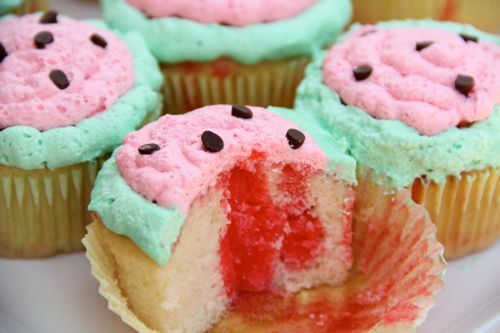 Cool cupcakes. Stir boiling water into powdered Jell-O until dissolved. Pierce tops of cupcakes several times with a meat fork or straw. Spoon Jell-O over cupcakes, making sure that the liquid is going down into the holes. 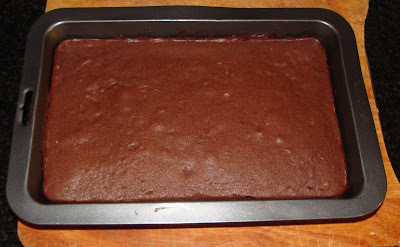 Refrigerate 30 min. Remove from pans. Tint Cool Whip with red and green food coloring. 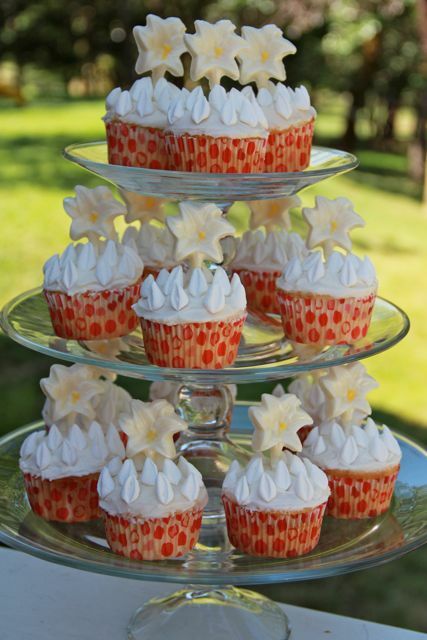 Using plastic baggies to hold the whipped topping, pipe a green circle around the outside rim of each cupcake. Fill the middle with pink whipped topping. 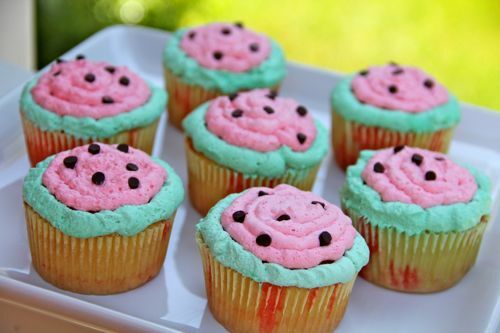 Add mini chocolate chips to represent watermelon seeds. Store in refrigerator. Best if eaten the same day. Additional Recipes for the Feast of St. Anne can be found in the archives! Firstly I'll start with the icing..allow it to be nice & thick, it has no sugar so you can feel guilt free about applying it thick! I use a 250gram pack of cream cheese (8.8 oz) and the same about of butter at room temperature. I then beat the two together, add cacao powder until it is a nice, deep chocolate colour, then I add honey to taste (I'm fairly liberal with it, for a lovely, sweet taste.) 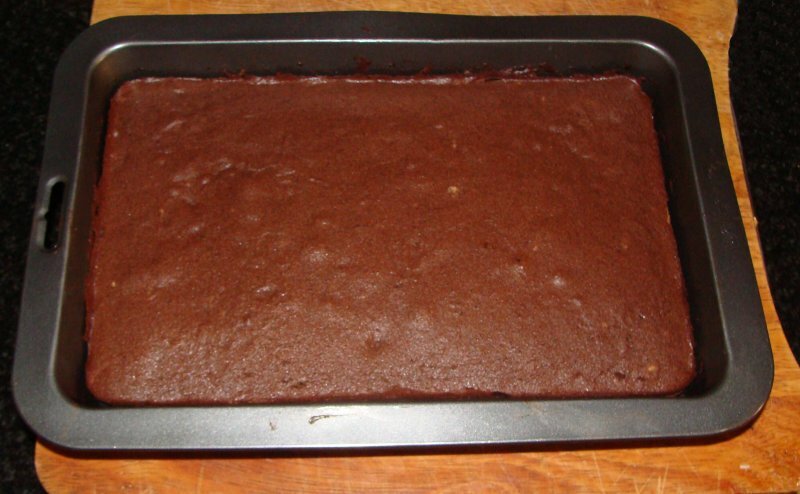 This icing holds together beautifully and very easy to apply to the cake. Mix the three lots together. 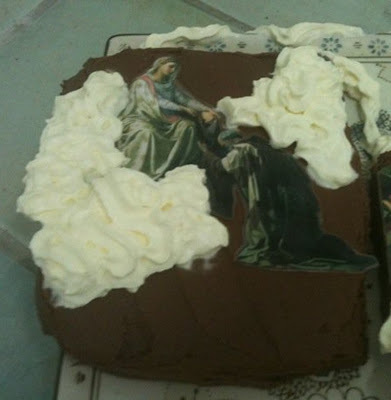 Pour half of this recipe into a dish with the measurements I mentioned above OR pour full recipe into a larger rectangular dish for a larger scapular cake. If you are using half the recipe, cook only for 20 to 25 mins at 180 degrees celsius (356 degrees fahrenheit) or for 35 mins if using the full recipe. 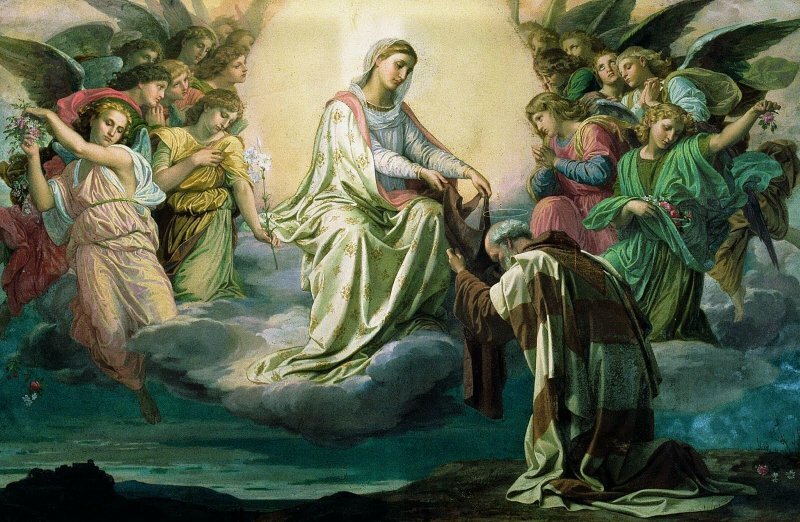 I wanted to do something a little different for the top of the scapulars...I found this breathtaking image of Our Lady of Mt Carmel bestowing upon St Simon Stock, the scapular. So I printed it up and cut out the two sets of angels and Our Lady and St Simon Stock. 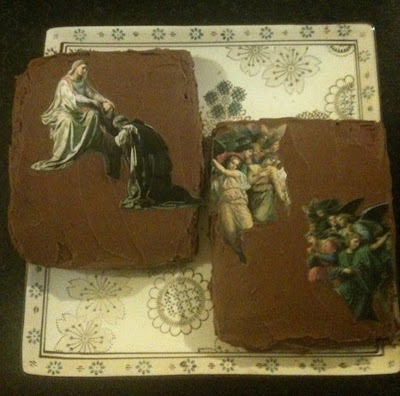 I then laminated the images so that they could lie on top of the cake without the image becoming damp. 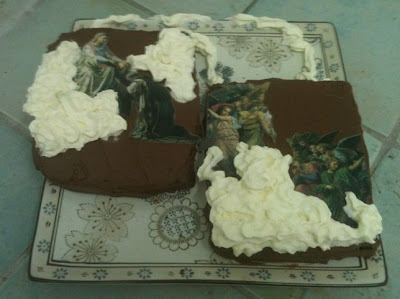 Here is the cake, once it came out of the oven..
Once I had iced it, I then added the laminated images to the top...the original picture is split among the two cakes, Our Lady and St Simon Stock on one side, the two sets of angels on the other. 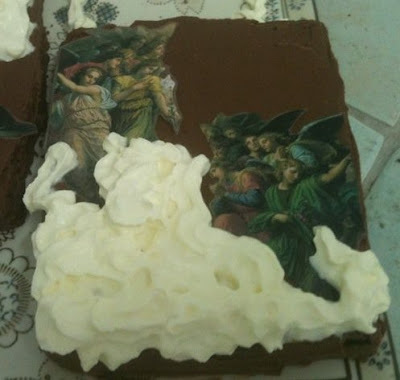 The picture has the Our Lady and the angels sitting among the clouds, so I thought I'd add those clouds back into the cake by making them out of whipped cream. Our Lady of Mt Carmel's scapular has been on my mind all week, as I finally start making homemade scapulars from scratch..these are scapulars for life ~ you will never need another, they will never break. I have also enclosed inside my scapulars, a miraculous medal, a St Benedict medal, an little photo image of Mother of Good Counsel and St Anthony's Brief. Those added sacramentals are securely sewed between the two layers of 100% wool felt and will never come out. 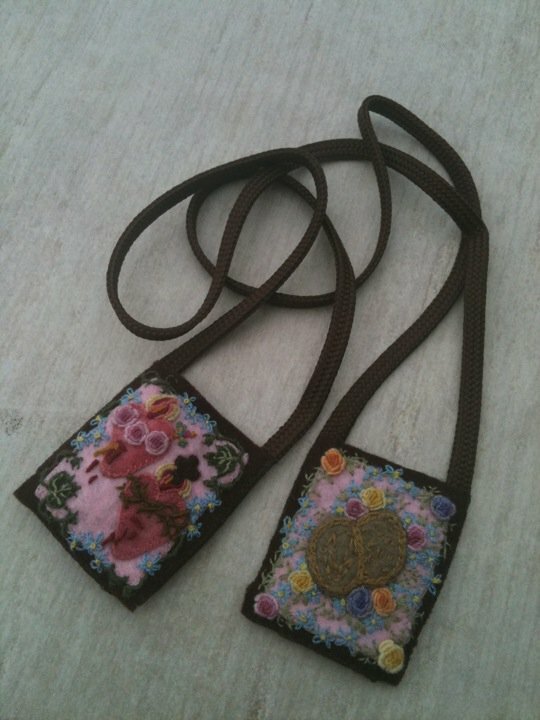 I have taught myself to embroider and designed the two designs you see below. My daughters are very keen to learn how to make these, and I hope to remake all the scapulars in the home, as well as make some for other relatives and friends. I hope to share a tutorial on how to make them, over at my blog very soon for anyone who may be interested in this craft. Tomorrow for the feast, we look forward to having the very youngest members of our family enrolled in the brown scapular after the Mass. Wishing everyone a blessed feast day and I ask for prayers for the family members of a young cousin of mine who died in a house fire almost 30 years ago on the 16th of July, the pain and suffering is always there for them, especially at this time. One side of the scapular has the Sacred and Immaculate Hearts design, the other side, the two sides of a miraculous medal design. Our Lady, queen and beauty of Carmel, pray for us. According to legend, a religious community was established even before the time of Christ on Mount Carmel. This is the mountain overlooking the Mediterranean Sea on which the prophet Elijah successfully challenged the priests of Baal and won the people to the true God. The feast of Our Lady of Mount Carmel entered the Calendar of the universal Church in the early 18th century. My family has a special devotion to Our Lady of Mount Carmel. She is also Sparkles and mine namesake – Carmen. Because of this, Dad coordinates this feast day celebration. Praise God! Dad has narrowed in on my favorite, Carmel Iced Coffee and his specialty, meatballs. This recipe is not my own. Dad found it on one of my family’s favorite recipe site, Pioneer Woman. We have been using her recipes for some time. We even started a cooking challenge, where we make one of her recipes every week – for the entire year. We have never been let down by any of her recipes. She gives great directions and provides wonderful pictures and humorous dialogue. Pioneer Woman is also a homeschooling mom! Provolone Cheese ~ White for the purity of Our Lady. Bread ~ The Bread of Life, Jesus – who Mary ALWAYS leads us to. I like using ground turkey, Dad prefers ground beef. Dad likes to make an extra large batch and freeze the cooked meatballs for future use.